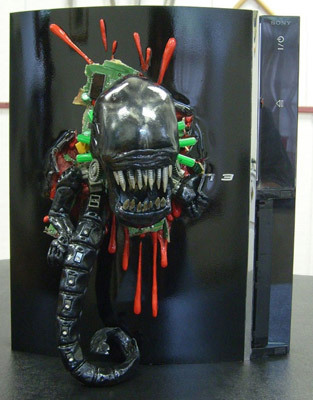 We have a interesting Case for the PlayStation 3 users, Its a PlayStation Case which is a custom design for xenomorph fans. This PlayStation 3 case has an a Alien coming out, tearing the chest as if its going to take your head out from your body. All credit for this PlayStation 3 Case goes to GivinTats already an expert in this field, This class artwork of modder GivinTats is awesome. Let look at some of the hot picture of this classy artwork, Aliens PlayStation 3 Case.